Saraswati is the Hindu Goddess of knowledge, music, arts, wisdom and learning. She holds a stringed instrument called a veena, a book representing knowledge and a mala of beads for mantra recitation and to increase focus. 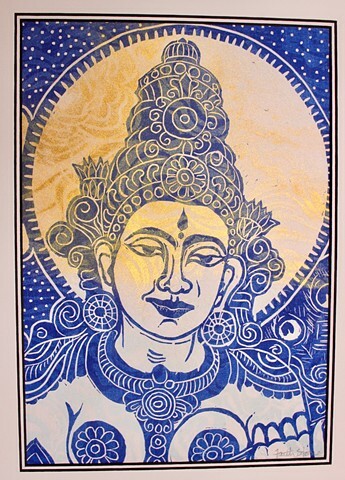 Saraswati is represented in both Hindu and Buddhist tradition. She is attended by a peacock. Saraswati is invoked by school children as well as musicians and artists to increase creativity, to speak eloquently, to gain knowledge and grow wisdom. This is a detail of a larger mokuhanga woodblock using 2 separate blocks with a cloud pattern in the under layer. I added gold color mica to the paint for a shimmer of gold. Mokuhanga is the traditional Japanese style of woodblock prints. Typically a separate block is hand carved for each color used. The blocks are printed onto Japanese Kozo or mulberry paper by hand rubbing with a barren. The inks used are sumie and watercolor inks. Mokuhanga is a labor-intensive old school printmaking practice.